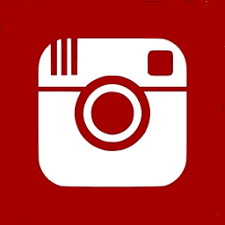 Herefords are renowned for their fertility, eating quality and ability to finish on grass. Rayleigh aims to maximise these attributes and breed lines of cattle with a competitive edge in the commercial industry. "So, get the Whiteface Advantage, Performance Cattle, Superior Beef". 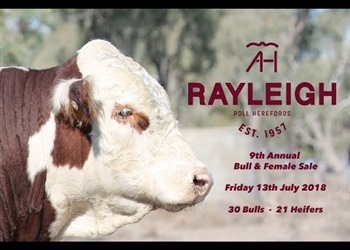 Rayleigh Poll Hereford Stud was established in 1957 on the Northern Plains of NSW, between Wee Waa and Walgett. Sold annually are 25-30 select bulls through our on property Bull and Female Sale, held in July. 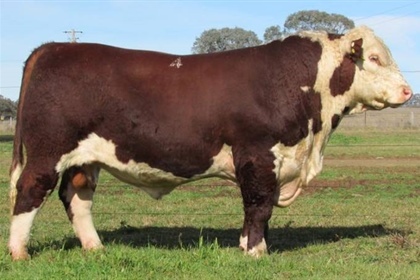 We additionally offer 1-3 select sires through the Hereford Australia Dubbo National Show and Sale, to showcase amongst the breed what we are trying to achieve as a stud. Held in conjunction with our bull sale is an open day, where sires and females from our Autumn program are on display to demonstrate consistency and type.